Welcome the newest and the swankiest co-working space in Pune - DEF Center that has opened shop at Suyog Platinum Tower, off Mangaldas Road in Bund Garden. Spread across 1,400 square feet, this contemporary little workspace is all things awesome. 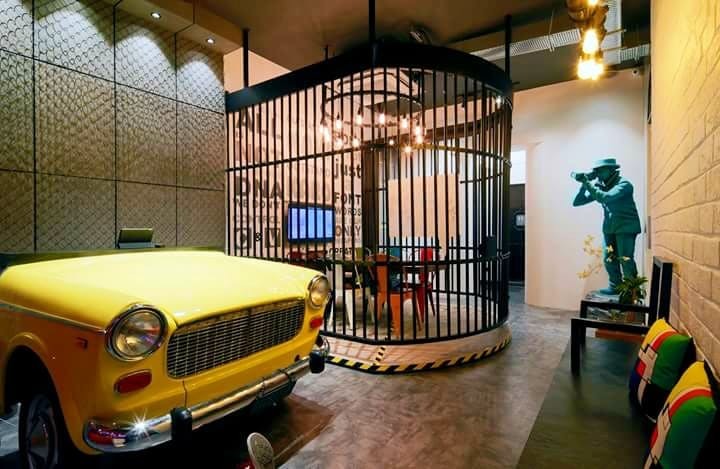 From cage conference room to bright red walls, quirky urban murals, and a vibrant yellow vintage car restored from scratch...DEF Center is the epitome of what modern, relaxed offices should look like. What we really loved about the space is its overall mood and vibe. It's fun yet energetic enough to drive you to meet those deadlines. DEF has two closed cabins and two open workstations. The cabins can hold up to 3-4 workers while the open spaces can accommodate up to 6 people at a time. There's also a special photo studio, designed specifically for freelance photographers who can come, do their shoots, and work. The studio is equipped with all kinds of lights and reflectors that one need to usually buy or rent. So, that's a huge plus point! Coming to the rates, DEF has daily cards priced at INR 400 per person per day. Dedicated desks are at INR 7,000 per month and photo studio is for INR 3,500 for four hours. DEF Center is a fairly new startup. So, the space is quite small and can accommodate 14 - 15 people at a time. We hope they expand soon.